Loueatsmore is fuelled by Louise, a New Zealander who is an avid Shanghai foodie. Growing up in Canada, Taiwan and New Zealand, Louise has a fond love for all things local and international. 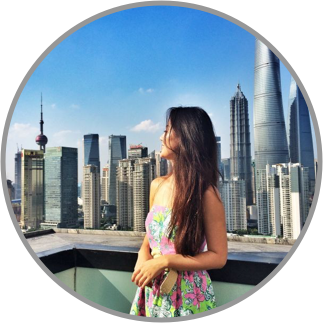 Lou is quick, fun and literally everywhere so if you want to stay up to date with Shanghai food trends, Loueatsmore is a must-follow! The renowned "Shanghai Girl" was born in Shanghai, raised in the U.S., and is now back in Shanghai. Here she's eating her weight in food and writing about it. Apart from some of the most beautiful travel photos the Adventurous Appetite blog shares stories and recipes from 5 years of traveling in exotic places! The 30-something international school teacher who is the talent behind the blog has a great passion for travel and food. The Pursuit of Snackiness is based on a very unique concept in that it's run by two Aussie siblings living on opposite sides of the globe! One of them obviously here in our beloved Shanghai! They like to travel and they love to eat so maybe that's why we always enjoy a visit to their blog. The Shanghai kid is a food blog written by Singaporean foodie turned restauranteur, Fred Lin. Having written many reviews for restaurants since 2013, Fred opened Hello Miss Dong in December 2014 on Yong Kang Lu, showcasing Singaporean dishes which he had been cooking at home for the past 8 years. When Nancy Jenkins, the author of Plus Ate Six is not eating her body weight in xiaolongbao, She's out exploring this fascinating city that is her home for now - walking down Shanghai's laneways and backstreets, checking out wet markets and taking too many photographs of food. The young Italian woman behind Expat Cucina was born and raised in a small town in the south of Italy (Lecce, Puglia). She has a strong passion for cooking and is sharing recipes and thoughts on her inspiring blog. Jing Theory is a website about food and culture by the Shanghai Based author. The vision of Jing Theory is to share stories that connect us through food! The fantastic food blog about yummy, colorful food! Thoughts on food - not just eating, but also culture, trends and people.